A train passenger's lengthy fight for compensation from a rail company got to the stage where bailiffs were "pursuing them at their registered office". Phil Davies was on a Leeds to Barnsley service which "abandoned" him and 40 other passengers in Wakefield due to a signal failure. 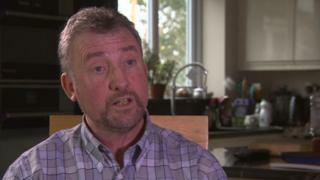 He claimed for compensation and won a legal case, but said he was left waiting for about £300 from Northern. Northern apologised and said the "matter had been resolved". On an evening train on 10 June, Mr Davies was travelling to his home in Barnsley when the line suffered signal problems. The passenger said they were left on the platform of Wakefield Westgate with no access to toilets, with a promise of a Northern representative arranging their onward journey not kept. British Transport Police eventually advised passengers to walk into Wakefield and find a taxi. Mr Davies said he complained, but was still waiting for a response after four weeks so began a small claims court case against the company. In October, a court ruled in favour of his claim for £283 plus £25 court fees, as Northern did not attend the hearing. After two weeks, Mr Davies said the bailiffs "automatically stepped in" as no payment had been made. "It's frustrating when a big corporation just snubs a consumer - we're small and insignificant." Mr Davies said. "Too often, the public are fobbed off by big corporations and they simply can't be bothered. It's about challenging poor standards so they're improved." A spokesman for Northern said: "We apologise for any distress and frustration experienced by our customer following the incident and his subsequent contact with Northern. "We fully accept the judgement of the court and have made contact to ensure the matter is settled. We have also made a significant offer of compensation to our customer - which is over and above the figure set out by the court." He added: "We are now undertaking a review of our processes to help ensure such situations do not happen again."